If you are new to arts integration, creating connections between core content areas and the arts can seem like a challenge. It takes intentional, authentic connection to elevate arts alignment from “arts enhancement” to true integration. It seems that the greatest hurdle is simply to develop a working understanding of other content areas: the big concepts, the vocabulary, the scope and sequence, and the resources available. With this challenge in mind, as you start to familiarize yourself with contents outside of your own area of expertise, finding big connections is key and will maximize your efforts. In arts integration, we want connections between core and arts standards to be authentic and naturally aligning. This gives us a great point to jump off from as we begin to forge connections, creating access to the arts and alignments to other content areas. As educators begin the road towards arts integration, my first recommendation is this: create your own chart of big connections. If you look at the elements of the arts (you can find FREE techniques posters outlining the elements of the arts on our website), some natural connections might begin to immediately come to mind. For example, “shape” in visual art is a natural connection to geometry. “Pitch” in music is naturally aligned to the science of sound. 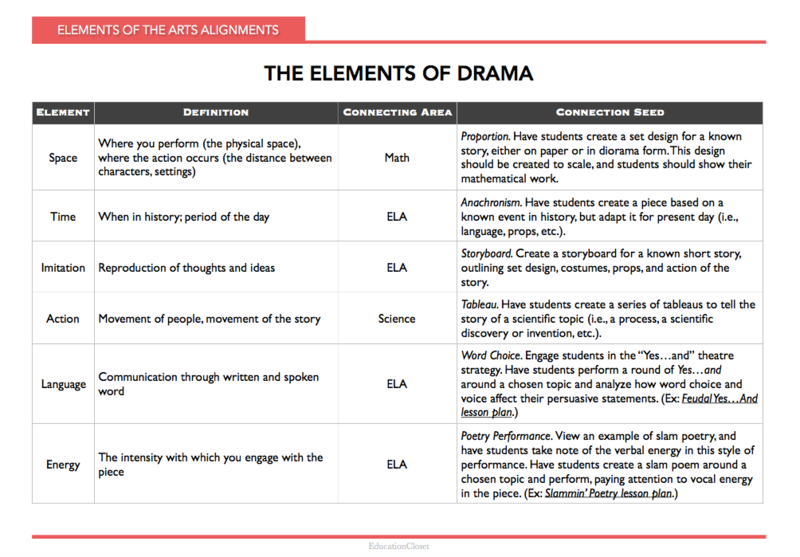 And every element of drama is closely connected to ELA concepts and standards. To help you facilitate the process of creating these big connections, of finding access to the arts by aligning elements to other content areas, you’ll find a template that will help you organize your alignments. This template includes the elements of each arts area and the definition of each of these elements. You’ll find space to connect the elements of each arts content area to a core content area, as well as a space to notate any lesson seed ideas or link existing lessons. Ready to get started? Here is a sample alignment chart for the elements of drama. While each element of drama has been aligned to a connecting content area and a connection seed, the possibilities are endless. I encourage you to use these templates as you begin to explore connections between the arts and other contents, and feel free to make it a living document- continue to add connections and seeds to your bank of resources.